Construction of the defensive West Brabant Water Line was started in 1627 by the Dutch states of Zeeland and South Holland as a series of forts, protecting the then main water navigation from Middelburg to Dordrecht against attack from the Spanish Armada. Over the centuries, the Line has repeatedly come under attack from foreign aggressors. Fort de Roovere north of Bergen op Zoom and originally located near the water before land reclamation, was largest of the forts. Over the decades, it fell into major disrepair, to the point that it was almost completely hidden, until 2010 when local authorities initiated a gradual project of regeneration. Starting by re-excavating canals and trenches to restore the fort’s frontiers, the programme has switched to developing playfully symbolic architecture across the site to celebrate its past. 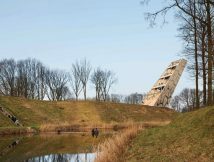 Pompejus Tower in Halsteren is the latest addition – a seemingly gravity-defying watchtower with extra functions built-in. RO&AD’s involvement in the project emerged from its local connections, as founder and architect Ad Kil recalls: “I’d just finished a small job on the then mayor’s house, and she asked me to make up some sketches for a watch tower and a bridge for the site. We then slowly got involved.” Since then, the practice has secured the role of resident architect on the fort, with enviable creative freedom over future additions. Fort de Roovere was an important focal point in the landscape for the Dutch. Separating saltwater and freshwater, it was at the middle of the dyke line, overseen by the fort towards Bergen op Zoom to the south and Steenbergen to the north. Pompejus Tower, taking its name from the first commander of the fort, rises 34 metres above the surrounding land, and 26 metres above its immediate foundations, the difference made up by the fort’s banks from which the tower protrudes. The steel-framed structure is enveloped in modified timber, and leans at a sharp 60 degree angle towards the outer edges of the fort, inverting the slopes and reflecting the angles of the banks beneath. Formally, the tower loosely resembles the shape of a triangular prism, wider at its base, tapering towards its upper extremity. The brief simply required “a watchtower that can see the waterline – that was the only condition,” Kil explains. Its generic nature gave the architects freedom to throw ideas around. “It had to be more than that,” says Kil. 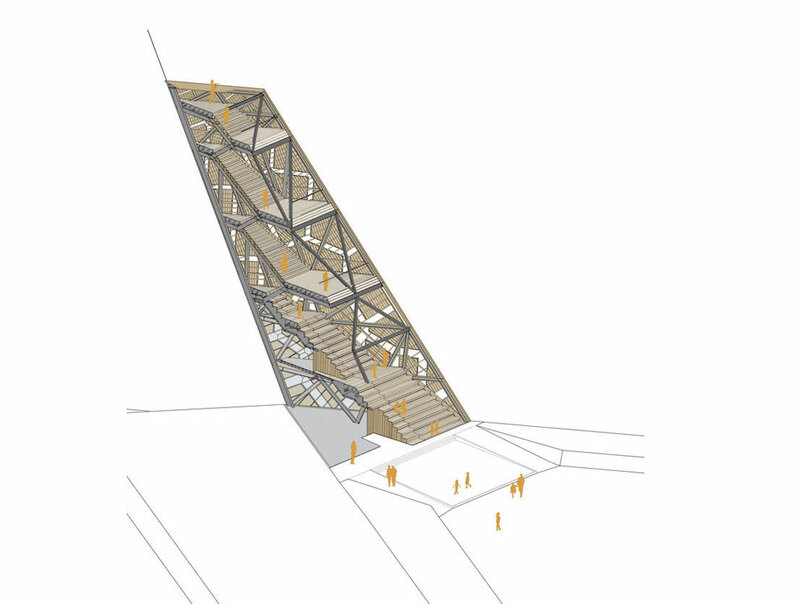 RO&AD devised a provision that weaves an open-air theatre and visitor centre into the scheme. “We saw the potential of Fort de Roovere being a base for local theatre groups and building connection with the cities nearby.” The two outward-facing facade elevations are clad in timber panels, plus a third inner side – host to a series of observation platforms at incremental heights – left open. A central doorway at ground-level provides access to a visitor centre nestled into the base of the tower, while another doorway one level up leads to storage facilities for theatre groups coming to perform at the fort. A square of concrete slabs at the foot of the tower’s open elevation functions as a theatre stage which is observable from each of the platforms ahead. 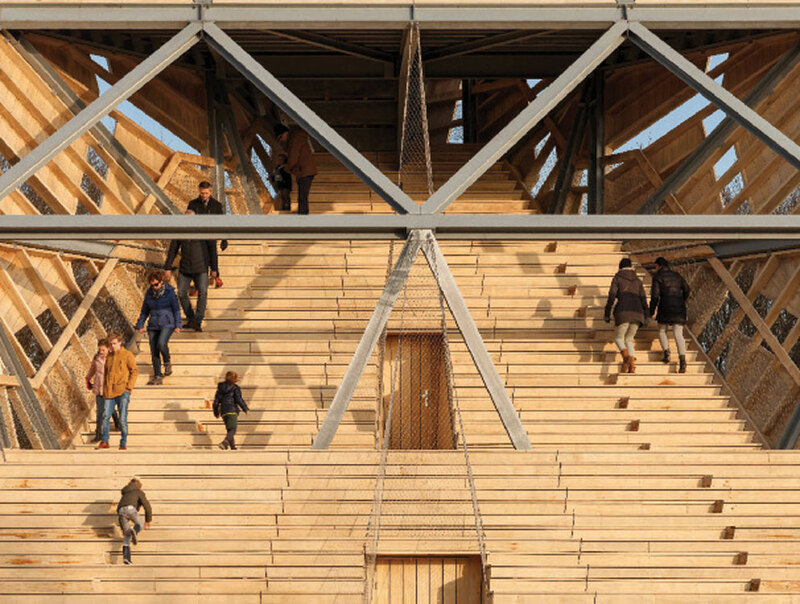 Multiple sets of timber stairs within the tower double up as benches at the lower levels, and provide vertical access to each of the observation platforms both to watch theatre productions, and at the top level – and echoing the ancient fort’s original purpose, to watch the waterline. Explaining why timber was used as the primary material for the tower, Kil says: “The original fort was built from sand, which is soft but durable at the same time. We wanted to replicate that, and use a softer material for the tower. 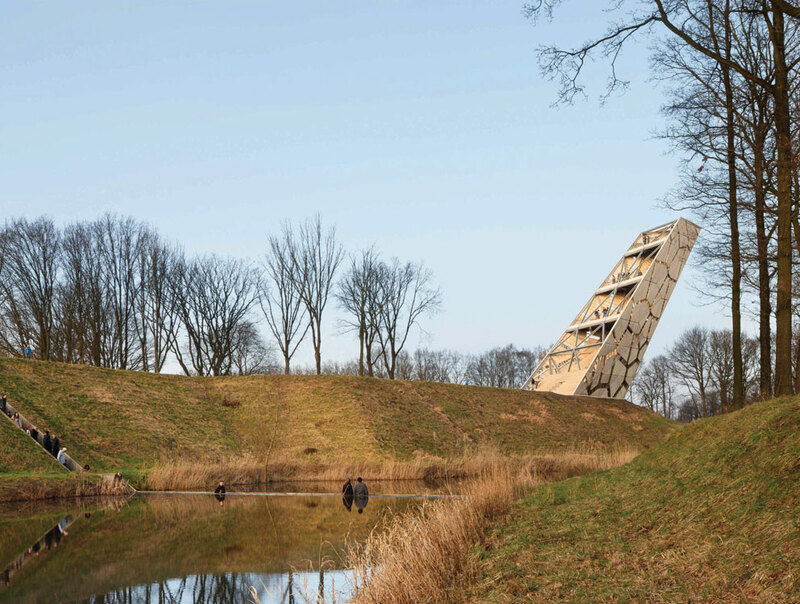 Plus, all of the historical military buildings were made from wood.” There was also the desire to align the tower’s design with the language of the existing Moses Bridge, located just 150 metres to the south. Like its submerged neighbour, Pompejus Tower features Accoya wood throughout – a New Zealand grown Radiata Pine which has undergone Accsys Group’s proprietary acetylation process, whereby planks of the wood are placed into a pressurised tank of acetic anhydride (high-strength vinegar) and are, essentially, pickled. The result is a non-toxic softwood with structural properties which rival and exceed even tropical hardwoods. Acetylation changes the free hydroxyls within the wood into acetyl groups. When the free hydroxyl group is transformed to an acetyl group, the ability of the wood to absorb water is greatly reduced, rendering the wood more dimensionally stable and extremely durable, making it much more resilient to water, and less susceptible to rot; a crucial factor given the Dutch climate’s perennial wind and rain. 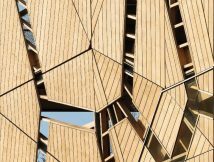 “Tropical hardwoods were the only other choice, really,” explains Kil, who favoured Accoya for its sustainably sourced fast-growing properties. “There was no doubt that we had to work with it,” says Kil. It was originally intended that the structure be made entirely from wood, but to achieve sufficient structural integrity, a massive quantity of wood would have been required, adding to existing budgetary concerns, so RO&AD resorted to a triangular steel framework – regulating costs and pleasing the structural engineers, who supported the leaning structure with piles driving deep into the banks’ soil. Initial designs conceived a tower 21 metres high. 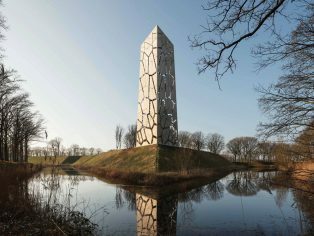 However, after surveying the site using drones, the architects realised that the tower’s scale had to be increased to better see over trees blocking views of the waterline from ground level. With the extra functions designed-in, and the height requirement increased, the initial budget of €600,000 was no longer enough to finance the project. “We needed to get people more connected to the tower. 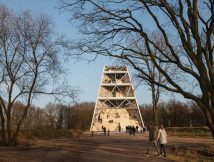 And we did that by crowd-funding and building the tower with local volunteers both companies and individuals,” says Kil. Using crowdsourcing, the project team was able to raise an additional €70,000 in cash for the scheme, as well as more than €300,000 in kind – in the form of expertise from local construction companies, labour, and building materials. To foster closer ties with the landscape and its history, the architects also wanted to get the local community involved in the construction process itself, however the tower’s complexity meant this was an even greater challenge, as Kil explains: “The design was really, really complicated, but we wanted to make it possible for volunteers to screw the tower together. So first, we went to a local school to get them put together a miniature model of the tower that we had designed – and they weren’t able to. How could we expect them to assemble the real building?” The fix came to RO&AD almost by chance. Kil recounts the story of a trip he and his fellow design partner, Ro Koster, took to a conference in St. Petersburg, Russia to present on various past projects. Also presenting was Toni Österlund from Geometria Architecture, a Finnish digital design practice, discussing a solution that they had devised that the RO&AD architects realised could be applied to the construction conundrum at Pompejus Tower. Using a set of algorithms, Geometria transformed the tower’s digital 3D model into factory-friendly blueprints which were used to fabricate a full set of flat-packed timber elements with matching instructions, allowing virtually anyone to assemble them by hand. This method not only reduced labour costs, it inspired a sense of ownership of the tower and a consciousness of the locale’s rich heritage among volunteers. Part of the tower’s complexity rests in the combination of a steel frame made up of triangles overlaid by timber cladding panels forming a ‘Voronoi’ pattern (similar to a giraffe’s spots). The fragmented design made for components which could more easily be manufactured, shipped and mounted together by unskilled volunteers. 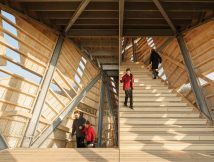 The pattern obscures the triangular framework beneath, signalling timber as the key material, and slits between the facade panels naturally illuminate the tower’s interior while allowing users to observe the surrounding scenery from varying heights. These panels are glazed at the levels of the visitor centre and storage area, shielding the interiors from the weather. As well as the more practical benefits, Kil also liked the idea of using a design that “established an aesthetic link with nature”. 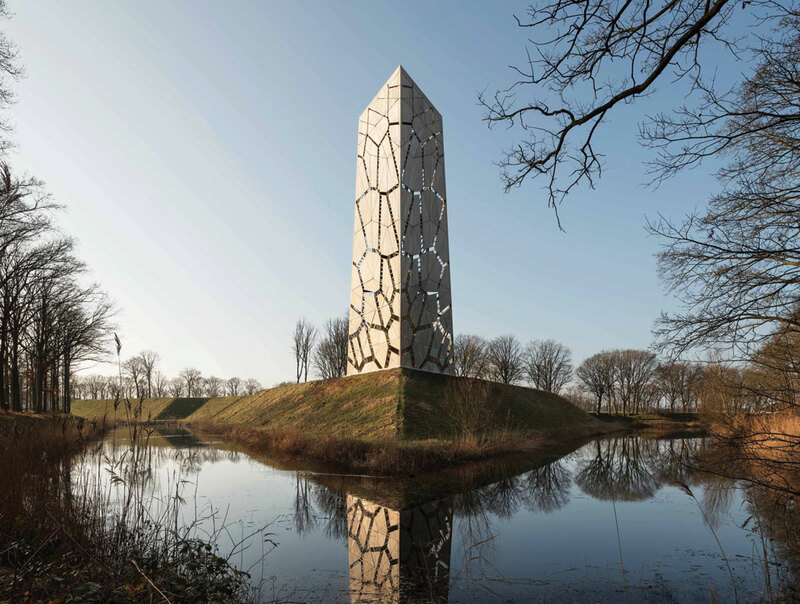 The new tower had its official opening in March 2018, with a christening of the open-air theatre featuring live traditional music, and an audience from the local community unanimous in their praise of the new, somewhat defiant monument. The municipality have since been busy curating a steady programme of performances from regional theatre groups for the summer, with the intention of further cementing the fort’s place in the future local cultural scene. 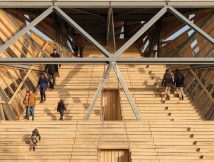 Carved into the steps of the tower for all to see are the names of individual donors and businesses who contributed help and expertise to the project, which is likely to receive visitors from across the globe, in the same way the Moses Bridge has, as Kil explains. “The bridge is featured in the Chinese ‘Top 10 sights to see in the Netherlands’ guide” – leading to significant numbers of Chinese tourists coming to Halsteren each year. The family of additions at Fort de Roovere continues to grow, with a new timber entrance bridge currently under construction which will recreate the bridge access of the original defences. Kil says that, compared with its counterparts, “this one won’t be a special thing – just a nice wooden bridge.” However modest it is, with sensitive placement into its historical context and the architects’ embracing of innovative and inclusive methods, it’s sure to be a key component of the ongoing success of this site. 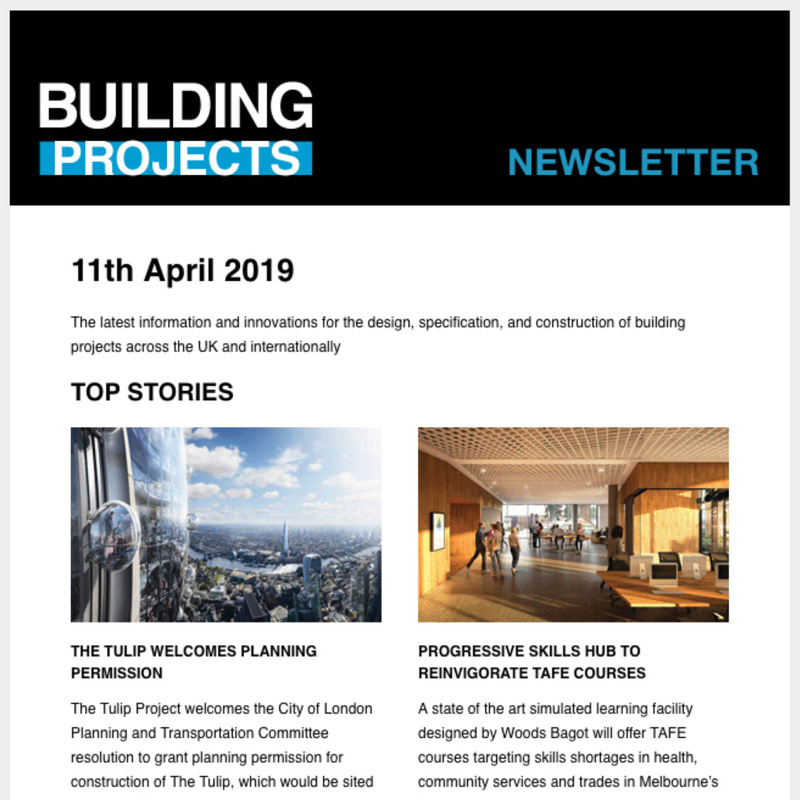 That success is largely down to carefully-conceived timber buildings re-energising a community’s connection with their built environment, and its past.